I've had the hardback edition of Love In A Nutshell by Janet Evanovich & Dorien Kelly in my collection since 2013!! I purchased Love In A Nutshell from the remainder section at a big box store. This book has been sitting around too long in my 'to be read' pile, so I finally decided to read it this month in honor of Valentine's Day and all things L-O-V-E related! Well, I wasn't overly impressed with this novel. It's not like I loved or hated this book, but I felt like Love In A Nutshell by Janet Evanovich & Dorien Kelly was easy reading... It's pure fluff, plain and simple!! Essentially, Love In A Nutshell by Janet Evanovich & Dorien Kelly is the perfect beach read/novel to read while traveling/on vacation if you enjoy reading romance novels with a touch of mystery. 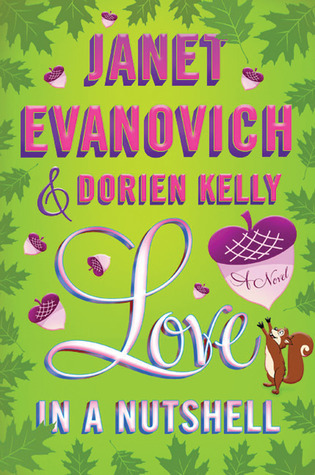 Love In A Nutshell by Janet Evanovich & Dorien Kelly has the predictable ending with mediocre characters. Kate Appleton needs a job. Her husband has left her, she's been fired from her position as a magazine editor, and the only place she wants to go is to her parents' summer house, The Nutshell, in Keene's Harbor, Michigan. Kate's plan is to turn The Nutshell into a Bed and Breakfast. Problem is, she needs cash, and the only job she can land is less than savory. Matt Culhane wants Kate to spy on his brewery employees. Someone has been sabotaging his company, and Kate is just new enough in town that she can insert herself into Culhane's business and snoop around for him. If Kate finds the culprit, Matt will pay her a $20,000 bonus. Needless to say, Kate is highly motivated. But several problems present themselves. Kate despises beer. No one seems to trust her. And she is falling hard for her boss. Can these two smoke out a saboteur, save Kate's family home, and keep a killer from closing in…all while resisting their undeniable attraction to one another? Filled with humor, heart, and loveable characters, Love in a Nutshell is delicious fun. Love In A Nutshell by Janet Evanovich & Dorien Kelly is an okay read. I am giving Love In A Nutshell by Janet Evanovich & Dorien Kelly a rating of 2 stars out of 5 stars. Ouch. Only 2 stars. I read Evanovich completely for escape and I only read the Stephanie Plum books. The plot does sound pretty thin. I also hate beer! I read Janet Evanovich novels for escape too. This book is good for that reason. I was trying to decide whether to rate this novel with 3 stars or 2 stars. It all came down to whether I'd recommend this novel to others or not... The 2 star rating equates to me thinking that Love In A Nutshell is okay. I didn't hate it, but it will be completely forgettable as time goes on.